I just returned from Philadelphia, where U Penn was hosting the 127th edition of the annual meeting of the American Ornithologists' Union. The meeting was shorter by a day that typical meetings -- the economy even affects already frugal ornithologists. But we had a productive meeting. It was good to be a representative of STRI, Panama, and Neotropical birds at the conference. Lot's of folks are interested in what we've been uncovering about Panama's cryptic bird diversity, and there was a few really interesting talks that shook things up a bit. For example we learned that Green Violet-ears from Panama northward are only very distant relatives of conspecifics in the Andes. Joel Cracraft reviewed recent geological literature which, along with trumpeters (Genus Psophia) suggests that western Amazonian forests are the most recent of the Amazonian biome. I'm sure the tropical tree ecologists at STRI would have something to say about that, since western Amazonia is the most species rich place in the world not just for birds, but also for trees, beetles, dragonflies, primates, etc. And we generally believe that older biomes have more species than younger ones. It's no understatement to say that I think that this was among the most controversial of talks at the meeting. (Top honors goes to an undergrad from Cornell who presented compelling evidence for a much better tree of the relationship among North American chickadees...the old tree didn't make sense, but that didn't stop it's authors from raising issue with the 22 year old who presented the new phylogenetic hypothesis. those that have throat colors other than blue. Genetic distances are large, and the authors of that study want to call each form a separate species. They didn't have material from the central part of Panama, but assumed it lumped in with the western Panama form (caeruleogularis) and not the eastern from (cognatus). But, George thinks that the birds from El Valle, Cerro Campana or elsewhere in central Panama may have Darien characteristics. Dear Birder, you can help out! 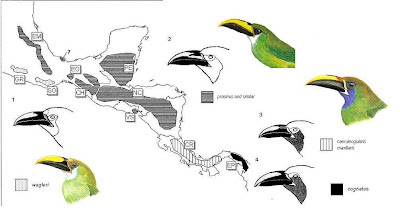 Field notes of Emerald Toucanets are helpful. We're looking for presence of a red dot on the base of the mandible and some day-glo sky blue around the eye. In Philadelphia, I compared 100 year old specimens from Boquete and northern Colombia and found that both marks werk pretty consistent among individuals. Hat tip to Nick Sly for the figure. Nick is another recent undergrad from Cornell that I hope will be visiting us for a short-term research project in Panama soon.